A State of Mind: How's That? Today was a big day at the SCG - and not just because of Michael Clark's amazing innings and Jane McGrath Day. The crowd included three special people - Prime Minister Julia Gillard, Premier Barry O'Farrell and even former Prime Minister John Howard. It appears from the various reports I saw that Gillard busied herself supporting the foundation, whilst O'Farrell soaked up the atmosphere and, I expect, posed for photos all day. It set me off wondering about the effect of politicians appearing at sporting events - why do they do it, and does anyone care? I should start by acknowledging one thing - politicians may just like doing it. Despite all indications to the contrary, politicians are still human beings who have likes and dislikes. It should be no surprise that, from time to time, they do things they like. I distinctly remember years ago seeing Kerry Chikarovski at a movie theatre. 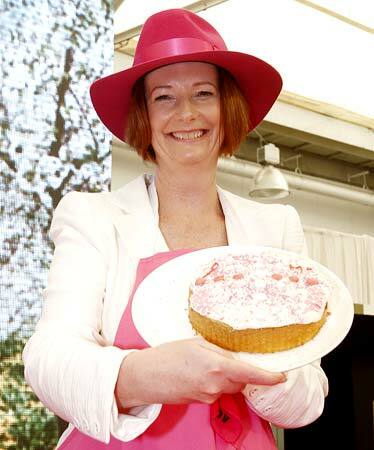 She was still opposition leader at the time, and had to endure her fair share of head-turning and pointing. But that is the price you pay for having a public persona, just like sports and movie stars. O'Farrell regularly tweets about cultural events he has attended. It doesn't seem like an attempt to garner votes or attention - it seems to me like something he does for no reason other than that he enjoys it. I think it safe to assume that Howard was at the game today because he loves it - he is a well known cricket tragic, and made more than his fair share of visits to commentary box over the years. Moreover, I understand that an enormous Boo echoed around the ground when he was shown on the big screen, although I suppose he is used to copping his fair share of derision these days. I understand that Gillard paid a visit to the Channel 9 box today as well. The below photo, taken by my friend @KateHislop shows some of the "indignities" that O'Farrell was subject to. My view is that these appearances help politicians. It reminds us that they are, after all, ordinary people (despite their extraordinary roles). People are a little warmer towards someone who they know enjoys a day at the cricket, and having a beer with his mates. 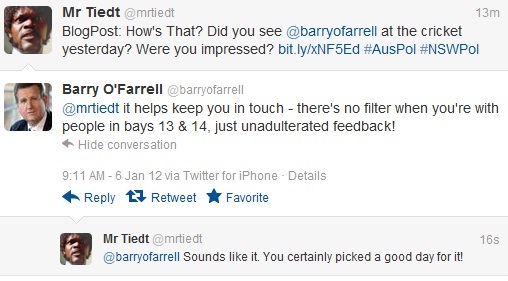 Of course O'Farrell isn't campaigning for anything at the moment, but he is building his brand as a leader. People remember this stuff. 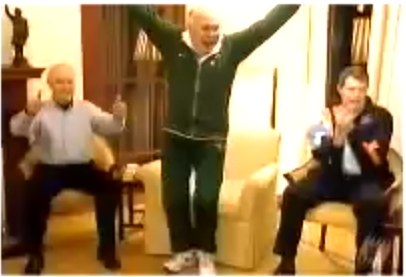 If memory serves, it was meant to be Howard watching soccer on TV. You can watch the video and judge for yourself, but to me it seems incredibly staged. It bombed, because people saw it for what it was - a transparent attempt to seem part of the crowd, when (at least in that case) he was staging the whole thing for the cameras. I don't know how much idea about or interest in cricket O'Farrell has, but if he doesn't know then he was wise to stay away from the commentary box today. Gillard made an appearance - I don't know what she said, but if she pretended to be there for any reason other than to spruik the Jane McGrath Foundation then she would have made a mistake. Should we cynical about politicians "acting like normal people"? Sure. Everyone knows that Tony Abbott getting a truck licence is a transparent political stunt. That said, Coalition voters don't seem very bothered about those kinds of transparent stunts at the moment, but that's another issue. But when it sincerely seems like something that the politician wants to do, I think most voters love that kind of thing. So expect to see more of it. Just keep the atrocious OZ MSM away. Done. Good to see that pollies get off their Gold Passes sometimes and get out among us! !